Today was a rare sunny day (the rest of the week is supposed to be rainy and cold) and besides studying, we went on a nice walk with Mr. 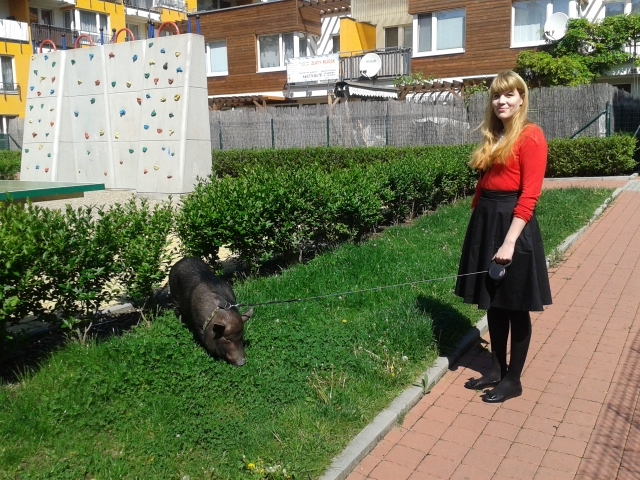 Pig, then we went to a family lunch (without Mr. 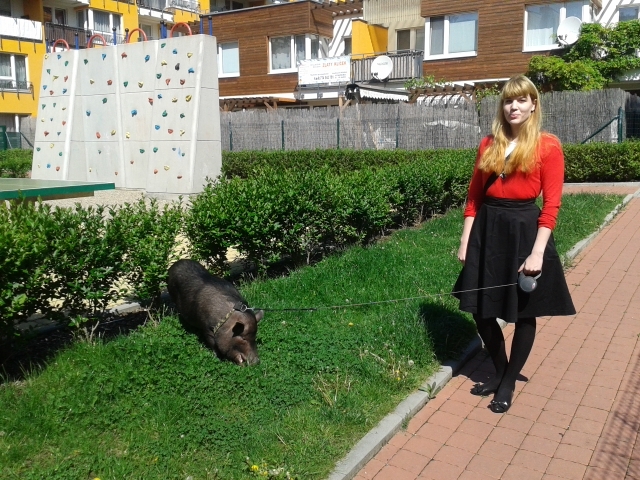 Pig) and later my sister stopped by the flat and she helped me with my French. I didn’t take outfit photos studying (ha, like anyone would want to see that), but since M went with us on our piggy walk, he was kind enough to play photographer yet again. It’s lucky that it’s Melissa Shoe Week because I almost always wear these shoes when I walk Dracul! Because I almost always wear these shoes while walking the pig, I wear these shoes literally (almost) every day! Yup, these are the most worn shoes in my collection. 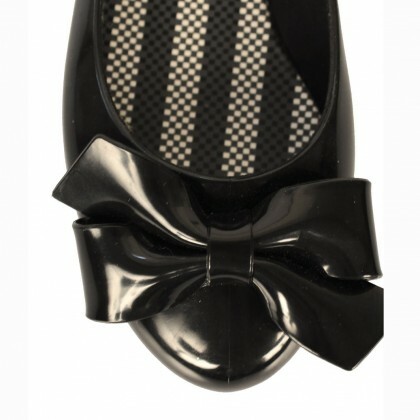 I bought them via Asos and I bought a size UK7 even though I usually wear a UK6 when it comes to Melissa shoes. I wanted to try out how they would fit as sometimes a UK6 can be a little too small for me. Well, they are definitely too big (I’ve actually bought another pair, I placed the order just today, but this time I ordered the size UK6) and so I was even thinking of returning them (though I hate returning things) but then I thought, whatever, I’ll just wear them as comfy shoes to walk the pig. Et voila! They’ve now become the most worn pair, it was destiny. I know I wouldn’t use them as pig walking shoes if the fit was better but then I would hardly ever wear them as there are a lot of shoes in my collection. And these are actually the ideal shoes for pig walking because they are jelly shoes and I can just wash them if they get muddy or if Dracul slobbers on them. So I think all-in-all it turned out just the way it should have and everybody’s happy. I’m happy. Dracul’s happy. Everything’s lovely. 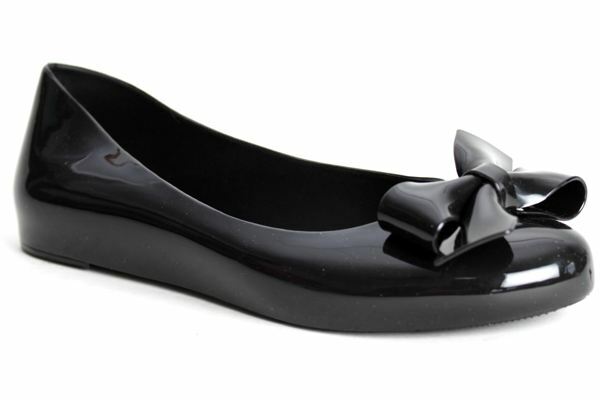 They are the “Tangerine” bow flats in black. If you click on the Asos link at the beginning of the post it will take you to the same pair but in navy. What I love most about them is the bow. I just really love bows, also otherwise it would have been just an ordinary black ballet flat, but thanks to the bow the shoe is a bit more special. I’ve mentioned ordering these again, well, I ordered the new pair from Melshoes and in yellow this time. Oh I can’t wait for them to arrive, I love the color yellow and these shoes remind my of pudding (in a good way?). But now I’m completely totally utterly broke, I don’t have a penny to my name, yup, but I do have loads of shoes. No more shopping until the summer, I swear. Anyways, I hope you had a wonderful weekend as well and see you tomorrow with another pair of Melissas.